Once a haven for writers and artists, Tossa de Mar is now a favoured holiday destination for families, couples and people from all walks of life who are drawn to this attractive town on the Costa Brava to relax, play, eat, drink and be merry. Tossa de Mar's picturesque, cobbled old town, the medieval Vila Vella, is highly atmospheric, enabling this resort to retain its historic atmosphere and authentic feel. An ancient Roman fortress overlooks the bay, providing a gorgeous vantage point for tourists seeking views. The sandy beaches are beautiful, and the town's position allows for easy access to other coastal resorts and the scenic hinterland for day trips and excursions. Although well supplied with shops, bars and restaurants, Tossa is not ideal for all-night partying and there is no nightclub scene. However, Barcelona is only 56 miles (90km) away and an ideal destination for those wanting to experience the energetic Spanish nightlife. Shopping in Tossa de Mar offers a selection of Spanish souvenirs, including ceramics, leather goods and clothing. Most shops are open from 10am to 8pm, closing briefly for siesta in the afternoons. Shopping is fun in Tossa de Mar, because of the quaint, labyrinthine streets. For true bargain-hunters, the duty-free shopping of Andorra is only an hour away by car, and the wonders of Barcelona are also easily reached. The prices at restaurants in Tossa de Mar tend to go up the closer you get to the beach. With over 300 places to eat in Tossa de Mar, there are a range of cuisines to choose from, including tapas, traditional Spanish cuisine, and various international offerings. Tursia, La Luna, Restaurant Pizzeria Bar Lluis and L'Ajustada all come highly recommended in Tossa de Mar for good food. Tossa de Mar doesn't have a wild nightlife culture for young singles; however, there are plenty of bars and restaurants for a more relaxed night out. Many restaurants host live music and stay open past midnight during the summer tourist season. Bars like Ardilla or Tahiti are good venues to find Spanish music like rumba or flamenco, and Trinquet is the place to go for acid jazz. Other places like Chaplin's and The Mediterraneo are popular with British tourists. 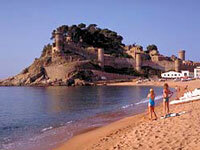 Snorkelling, scuba diving, swimming and boat trips are some of the most popular things to do in Tossa de Mar. There are three beautiful beaches: Platje Gran, Mar Menuda, and Cadolar. The nearby Lloret de Mar resort offers more active pursuits like waterskiing, jet skiing, and parasailing. However, the winding cobbled streets of Tossa de Mar are also worth exploring if you can drag yourself away from the ocean. There are a few historical buildings and ruins around the city, and a museum that has some paintings by Chagall, who spent time in Tossa de Mar. About 18 miles (30km) from Tossa de Mar is Marineland, which has animal shows, waterslides, and a children's zoo. Tossa de Mar's popularity in summer means it can be extremely hard to find accommodation unless booked well in advance. During low season it can be very quiet, with not much of a nightlife.